The CSWS Pre-School programs draw from a variety of progressive and traditional thoughts on education. Two that are extremely influential to us are Emergent Curriculum and The Project Approach. We often say ‘the children are the curriculum’. The staff and children co-create the experiences and the learning. For example, a child may find a bug and show everyone. The teacher asks “what kind of bug is it?” The child doesn’t know so the teacher facilitates that discovery by finding a bug book to look through. They discover it’s an ant. The child asks “but where are the other ants?” This leads to a two-day investigation of ants. The children guide the learning with their questions and curiosity. The teacher pays attention to the themes coming out of the interests from the children and provides relevant opportunities for exploration and learning. As a class they read books, maybe do a counting activity using plastic ants, learn what letter “ant” starts with. 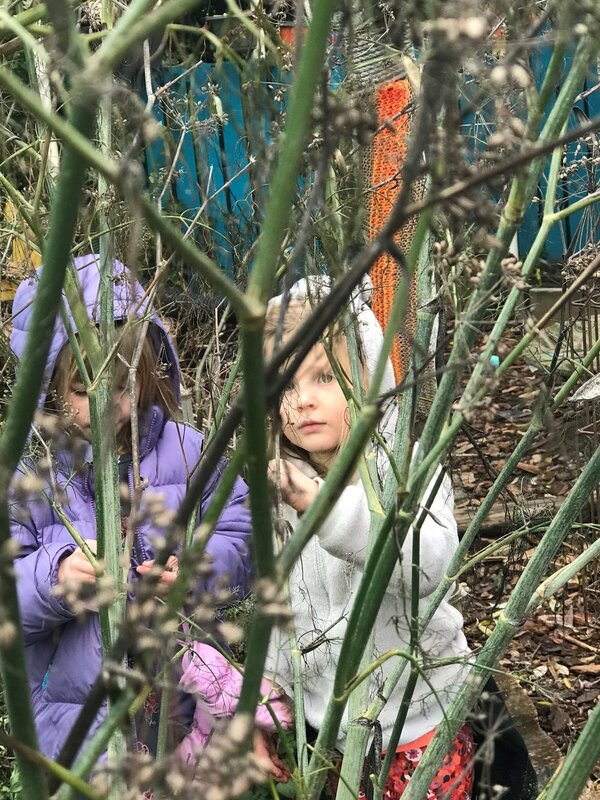 They learn about habitat, community, social connections, and build empathy. Art projects emerge, drawing ant paths or maybe creating papier-mâché ant hill and clay ants. It’s not planned in advance but the teacher has planned for the spontaneity and our teachers are skilled at staying present and alert to what opportunities are arising. This is Emergent Curriculum and the Project Approach in action. It is purposeful and meaningful and offers the deepest connection to learning because it comes from a real interest from the child. We set-up an environment that supports a child’s natural desire to learn and we offer materials that inspire any number of creative and educational experiences. It looks a lot like ‘play’, and it is, but we offer purposely enhanced and facilitated play with a variety of equipment that is designed to stimulate creativity, thoughtful exploration, problem solving and small motor ability. Fundamental to our approach is building relationships, this allows us to connect with each individual child while also introducing them being part of a community. We support and assist each child with social and emotional growth and development so that they can better understand and advocate for their own needs. We also nurture the development of awareness of the needs of others, build empathy and compassion, and model skills to negotiate and cope with competing needs and wants. We ensure the physical environment is safe but we also pay special attention to providing emotional safety by using compassionate communication to connect and assure that each member of our school community is heard, validated and welcomed. An important aspect of developmental learning in preschool is working on creative problem solving and helping children understand the balance between one’s own needs and that of the group. Our staff stays aware of both these important elements. They offer guidance and support while children are working it out together. We want the children to have the opportunity to be creative in their solutions, and while the resolution may not be what we would have done, the important thing is that they worked it out together. This will help them form meaningful relationships as well as reassure them that they are capable of conflict resolution. Our favorite tool for guidance is Positive Discipline by Jane Nelson. All of our staff is trained in this work. Children acquire learning through play and interaction with caring adults. Hands on experiences allow children to make the physical and mental connections so important to the human experience. These come naturally from play. Children are always learning. It never stops. As a school we focus on feeding that fire with interesting, relevant and developmentally appropriate opportunities and a staff who will support and guide them in a loving and nurturing way. At CSWS we trust that each person, given an enriched, nurturing and intentional environment, at school AND at home will enjoy a life-long love of learning. 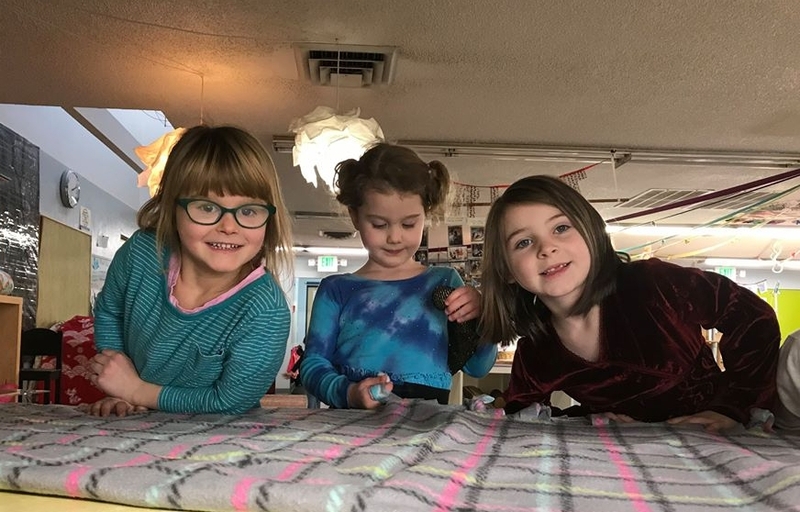 The Community School of West Seattle offers each child a solid foundation on which to build a lifetime of fulfilling and meaningful education. It is our intention that children who attend our preschool classes will be able to integrate into any educational environment with an intact love for learning, self-confidence and the necessary academic skills they need to continue on in their educational journey, whether that is home schooling, public school or private education. Opportunities for math are everywhere. What this may look like in the classroom might be putting out attractive things to count, sort and classify. Using a guessing jar with items in it that we count. We use concrete items because this is how children at preschool age understand. 10 pennies are more than 3 pennies when they see it and feel it. The snack table is one of our favorite math activities. Children often count and sort their snack and we make a point to ask questions like, “If Emma eats 6 of her pretzels how many will she have left?” It usually only takes one question and then the children ask each other questions or they practice edible subtraction by themselves! We use the correct mathematical terms (more than, less than, equal to, divide, subtract etc…) so that this language becomes a part of their everyday experiences. We add the use of graphs and charts and make full use of the increased awareness of numbers and how math can help us figure out all kinds of answers to our questions. Math is integrated into something real so that children feel connected to it and it has direct relevance to them. Science in our school can look like measuring, pouring, filling and dumping in the sensory table, the sand box or in the kitchen. We might measure how much rain fell or how big the tower of blocks has become. We want children to be able to question things in the way scientists do. Why doesn’t all this sand fit in this bottle but is able to fit into this bucket? How does the water make the wheel go round? I wonder what will happen if….It is from these experiences that children answer their own questions and more importantly come up with new ones. Activities such as making play dough and moon mud provide perfect opportunities to see science in action. When I mix this with that, what do you think will happen? Children get to think about the outcome and then actually experience it, reflect on their thoughts and discuss the experience with their friends and with you at home. As the children get older we take this a step further by writing down their observations, making record of the outcomes and asking them ‘why’ they think something happened. We spend a lot of time talking about the way things work, why something happened and what was discovered. We want to get children to really think about things, ask lots of questions, and make their own discoveries. Reading and writing are also skills that are naturally supported through enriched play exploration. Young children are building the dexterity to be able to perform the physical task of reading and writing. They do this with small motor experiences like puzzles, lacing and drawing with a pencil, even riding a bike helps promote good coordination which in turn helps the brain organize its functions. At CSWS we nurture and support the child’s natural curiosity around reading and writing in developmentally appropriate ways. Most children LOVE to sit and listen to stories being read to them, and we do that often, sometimes in small groups, sometimes one on one and it is so delightful to see a child ‘read’ to another child. Even though they may not actually be ‘reading’ the words they are doing the ‘act’ of reading and that is the first step towards fostering a love for reading. As children turn 4 and 5 there is a much higher interest in letters because these children are starting to make connections to the outside world and not just the one directly in front of them. Developmentally they are ready to explore. Like all of our curriculum, our teachers are always looking for ways to bring this learning to life in concrete and meaningful ways. We encourage children to look for their own internal approval of their creative expression. The value of the work should only be determined by their experience. When a child asks us “do you like this?” we return with an observation such as “you seem really excited about your drawing” so that the focus can return to their own experience. You’ll never get precut, prearranged work that looks like everyone else’s from here. That’s not art, that’s doing what your told, there is a time and a place for that but the Studio is not one of them! We are also careful not to miss the simple joy of splashing paint on paper and walking away. We know that moment was all it needed to be. It’s not a masterpiece or a waste of paper. It was a valid experience for that child in that moment. Much of what happens in the studio falls under the definition of small motor activity. Cutting, gluing, tearing, sorting, using tape, painting, molding clay etc…This type of activity helps build the small muscles in the fingers and hands, as well as strengthen eye hand coordination, eye muscles, build concentration, critical thinking and communication, all of which are necessary pre-reading and writing experiences. Music is a large part of our community. Through the years we have had many musician families and teachers pass through our school. We love to encourage our students to use their voices and instruments to experiment with music. Music has been shown to have many benefits for development in early childhood education. It facilitates learning for a variety of subjects as many children’s songs feature counting, word play, rhyming, or exploration of themes. Music has been shown to assistant brain development in a wide variety of areas. Music is also, of course, meaningful as a way for students to learn to express themselves creatively. For these reasons and many more, we have committed a dedicated resource to developing our music program. Our music teacher, Joey Vargas, provides music to each classroom every day. Come early for pick up on Fridays and experience our all school sing-a-longs! All four of our classrooms are connected to secure outdoor spaces. 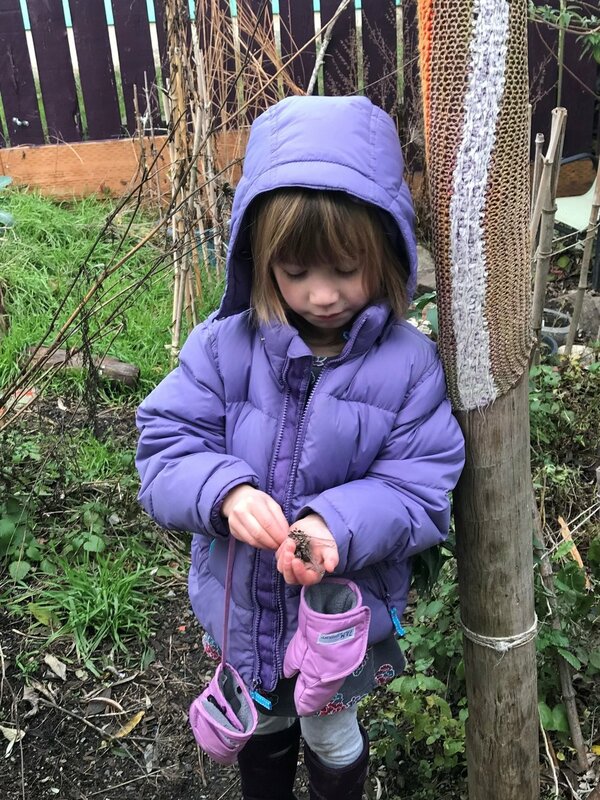 The changing seasons provide many rich learning experiences about science, gardening, sharing our space with other living creatures, and the cycle of life. The children participate in many explorations, observations, and discoveries. Our goal is for students to spend time outdoors every day, rain or shine, except for during extreme weather events. We recommend having boots and an extra set of clothing tucked away in your child's cubby! The Community School of West Seattle is a not-for-profit 501(c)(3) organization. Click here for our IRS 990 reports.